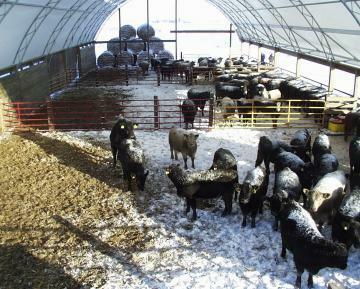 The mission of the Farm Animal Behavior and Welfare laboratory within the Department of Animal Science at Iowa State University is to develop sound scientific measures for animal welfare, through a multi-disciplinary approach utilizing: physiology, immunology, neuroscience, cognitive abilities, behavior and performance and health. The findings can be introduced and applied back to current farming production practices to enhance farm animal welfare and to increase performance and health. (1-2) CR. 2. F.S.SS. Understanding of animal perception in order to develop best care practices involved in handling of livestock species. Intensive development of skills associated with handling and moving healthy and compromised livestock in respect to human and animal welfare. 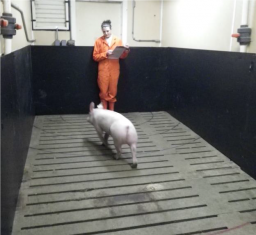 Integration of scientific and theoretical knowledge of biosecurity and animal-human interactions as it relates to livestock handling and movement. Syllabus (2-2) Cr. 3. F. Prereq: One course in physiology. Concern about the well-being of domesticated animals has increased dramatically in the United States and across many other industrialized countries. The issues involved are complex, and there is widespread disagreement both as to the extent of human responsibilities toward animals and how those responsibilities should be carried out. Although human ethical attitudes are an important part of the dialogue about animals in this course we will not deal directly with human values, but will instead attempt to look at the problem from the perspective of the animal. Who are animals? What can they experience? How can management practices and environments be modified to improve the well-being of animals? We will attempt to gain some basic skills and perspective in this course that can enable us to begin addressing these questions systematically. (3-0) Cr. 3. Alt. S. Prereq: Permission of instruction; MS, DVM or PhD student. Repeatable. Each semester students’ focus on different topics related to animal behavior, animal welfare and contemporary issues related to animal behavior and welfare. Each topic is separate and distinct, and students may enroll in multiple topics. This is an on-line course only. Each topic may be taken only one time for credit. The chief goal of Dr. Johnson’s research program is to develop practical information and tools that can be used by producers, animal caretakers and veterinarians to provide optimal farm animal welfare. The significance of this research area cannot be considered in isolation of other complex factors that allow for successful and profitable farming, i.e. human safety, environmental, health, economics and ethics. 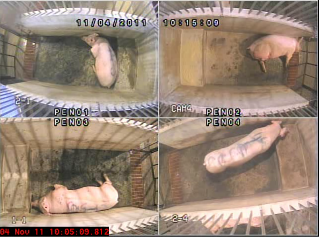 Dr. Johnson focuses on (1) sow productive lifetime (2) animal-human interaction (3) environmental enrichment and (4) Precision Livestock Farming. Dr. Johnson is an actively engaged, committed and trustworthy extension faculty member, and have a thriving farm animal well-being extension program at the State, National and International level. Dr. Johnson’s role is to expand knowledge, encourage the application of new ideas, and provide unbiased and relevant information to many audiences in a timely manner. Dr. Johnson serves on a variety of state, National and International Committees. For example, Dr. Johnson is a state PQA-Plus trainer and serves as the chair for the Iowa Select Animal Well-Being committee.